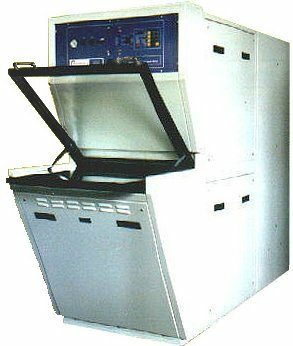 The ultimate in single drawer exposure units, the Model T4000 is a double sided exposure unit for medium volume production of single or double sided printed circuit boards. It has been designed for those producers that carry out a large variety of work which will include a major proportion of liquid photo imageable solder masks. The main feature of this unit is Cirgraphics unique compartmentalised cooling system, which allows the vacuum area to be kept cool whilst the lamps are maintained at their much higher optimum working temperature. All the main functions of the Model T4000 are controlled by a PLC, with all the variables and options such as exposure and vacuum, being held in each of its 8 memories. Exposures are controlled by the PLC, which monitors the light output through 2 "Light to Frequency Converters" these will accurately measures the amount of UV energy reaching the board, ensuring repeatable exposures throughout the life of the lamp. The UV output of the specially designed lamps have a major peak at 365nm which closely matches the spectral response of the majority of dry film and liquid resists currently available. The energy output of this lamp can be switched to either 1kw, 2kw 3kw ,or 4kw power, allowing for different photo resists to be used..
As standard, the Model T4000 has a well proven low profile vacuum frame which includes a specially designed hard wearing moulded seal. This facilitates very quick changing of the polyester sheet and a fast evacuation of the vacuum drawer. The system also helps to eliminate upper photo tool shift. In addition full or soft vacuum can be selected within each memory and a variable vacuum delay can be entered to ensure the vacuum is stable before the exposure commences. The Model T4000 is a well proven exposure unit with a fast and accurate capability. Engineered to last and with ease of maintenance in mind, the Model T4000 will give many years of reliable hard work.